I found these baby socks in a garage sale free box and grabbed them knowing I'd be able to use them for something (FYI - NOT a baby!). I love the real life matching/ laundry skill application. 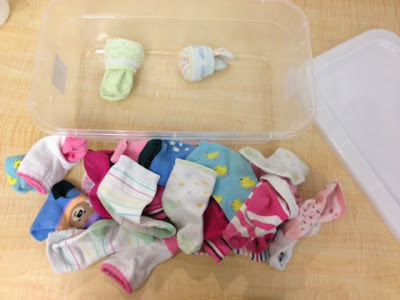 Plus since they are little baby socks I can fit more in a single box! Speaking of things I have a lot of, foam shapes!!! 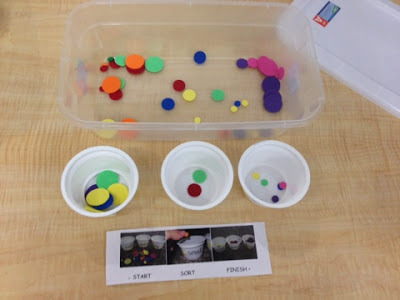 Seriously I have been giving like 5 tubs of the things, so I went through and grabbed some big, medium, and small circles for this task. Oh, and those are yogurt containers I separate them into. 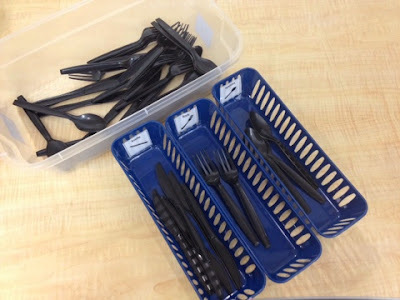 Silverware sorting task. Trays came from the dollar store (in a pack of 4) as well as the silverware. 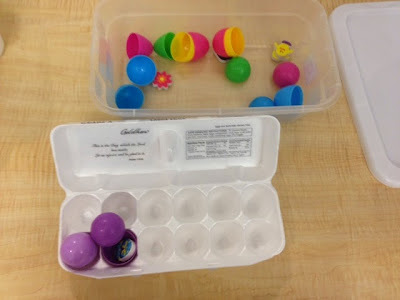 For the Easter egg task, students match the colors for the top and the bottom of each egg and also adds an eraser in the egg. The egg carton made this task do-able for one of my students who could only use one arm, he positioned the bottom in the carton and was able to snap on the top that way. I also have a student whose job is to crack open the eggs and take out the erasers. Packaging task using office supplies. I taped an "order form" to each sandwich bag. Download the order forms here. The preview on google docs looks weird, but download it in word and everything should look right. 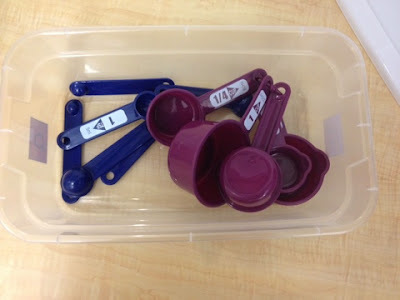 Measuring cups and spoons - putting them in order and placing on the ring. 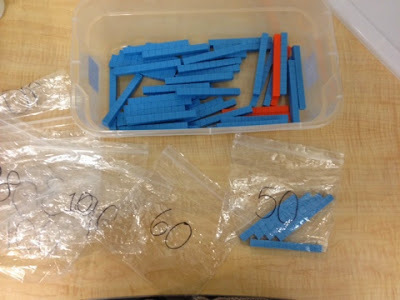 Counting by 10s with math manipulatives. 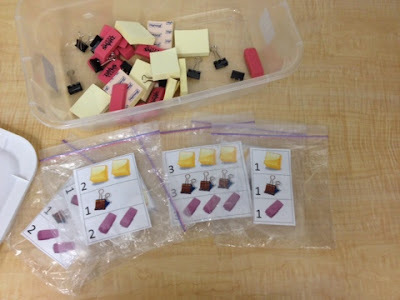 Each bag has a number that the student needs to fill using the math rods. For more work task box ideas, check out these below and follow on facebook! Great ideas, Brie! 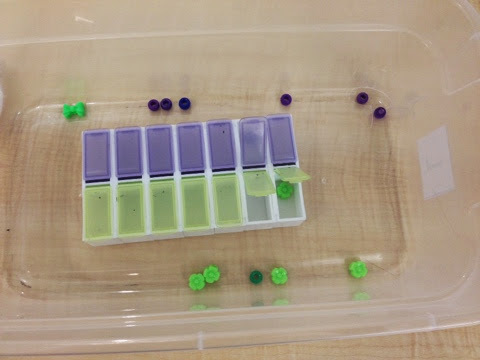 I love using the egg carton for the Easter egg task - I have several students who only have functional use of one hand so this would definitely help them be successful! Thanks for the suggestion! Wonderful! You are so welcome! I realized I might be kind of sad when you wrote, "You're super-excited, right?" and in my head I said, "Absolutely!" Thanks for linking up! I love the office task! So cool with the templates--and who can believe I never thought of baby socks! Easier for the students to learn on than big ones too! Thanks so much for all of the great ideas! I tried to download the order forms but was unsuccessful. Do you have them set to share with others? These are terrific. OMG I just left a TEACCH training today. I wish I took pics of all the tasks we made!!!!! Thanks for sharing. I wish you did too!!! :) You'll have to share the ones you come up with! How did you get them back?